On 31st May 2010 the inevitable confrontation occurred as the "Free Gaza" Flotilla that had set out from Turkey and Cyprus to break Israel's blockade of Gaza's sea port approached Gaza and IDF forces attempted to prevent them landing in Gaza. The anti-Israel activists set out to make their (untrue) point that Israel has been blockading Gaza to keep out essential items and have caused a humanitarian supplies. They also claim Israel is breaking "International Law", which is not true. If we understand what the situation really is in Gaza, the Free Gaza Aid Flotilla can be seen as a ridiculous charade to be played out for world media. It was a trap for Israel to damage its standing before the world, and it succeeded. See also Gaza Blockade, Gaza Blockade Legality, Gaza, Gaza demos, Gaza videos , Gaza by Kemp and Sderot. The author was away, camping, when the inevitable confrontation occurred early on the morning of 31st May 2010 and first saw the news on the newspaper headlines; some shrieking condemnation of Israel and others more measured in their disapproval. The world media reported at least nine people killed by the Israelis. However, the Internet provided the other side of the story as correspondents probed the many deeper and darker aspects on the whole "Flotilla" story and the Israeli MFA responded quickly with information briefings and video footage. Here is one video report. See also a response from Prime Minister Netanyahu. You probably did not see this in the media! Daniel Pipes, director of Middle East Forum, says there continues to be a campaign to delegitimize Israel — one that pursues Israel's isolation step by step. "This is an effort to delegitimize the state of Israel and deny it its fundamental rights," said Dore Gold, Israel's former ambassador to the United Nations in an interview with CBN's Chris Mitchell on the flotilla incident." What Israel engaged in was a legal blockade of a terrorist entity," Gold continued. "Blockades are used by the British, by the U.S., by many countries who are engaged in war. And Hamas, which controls the Gaza Strip, is at war with the state of Israel, calls for its destruction launches Iranian rockets at our civilians. "Iranian President Mahmoud Ahmadinejad has been attempting that in his rhetoric, alluding that if the Israel problem would be dealt with, there wouldn't be an Iranian issue. Syndicated columnist Cal Thomas wrote, "Does it strike anyone else as beyond coincidence that within hours of Israel's commando raid on a flotilla of ships bound for Gaza — ships supposedly containing 'humanitarian supplies' and left-wing 'peace activists' — that demonstrations broke out in Europe and outside the Israeli Embassy in Washington ? As someone else asked, "Why does a convoy carrying Humanitarian Aid need 700 Anti-Israel activists on board?" According to the IDF, the following passengers on board the Mavi Marmara are known to be involved in terrorist activity. Fatimah Mahmadi (born 1979), is a United States resident of Iranian origin, and an active member of the organization "Viva Palestine", she attempted to smuggle forbidden electronic components into the Gaza Strip. Ken O'Keefe (Born 1969), an American and British citizen, is a radical anti-Israel activist and operative of the Hamas terror organization. He attempted to enter the Gaza Strip in order to form and train a commando unit for the Palestinian terror organization. Hassan Iynasi (born 1982), a Turkish citizen and activist in a Turkish charity organization, is known of providing financial support to the Palestinian Islamic Jihad Terror organization. Hussein Urosh, a Turkish citizen and activist in the IHH organization, was on his way to the Gaza Strip in order to assist in smuggling Al-Qaeda operatives via Turkey into the Strip. Ahmad Umimon (born 1959), is a French citizen of Moroccan origin, and an operative of the Hamas Terrorist organization. The term 'peace-activists' that was used to describe those on board the Gaza aid flotilla fleet, was a strategic guise for those planning to employ violence against the Israeli soldiers once the fleet was stopped. Similar to Hamas's mode of human shield tactics, where terrorists will fire against Israeli troops while hiding among women, children, and civilian populated areas, the pro-Palestinian protesters also brought along small children on the boats. The director of the Turkish Humanitarian Aid Foundation sponsoring the flotilla (IHH), Bulent Yildirim, held a one-year-old infant in his arms, as a "message" to Israelis on Sunday May 30 during television interviews that he gave on board the Mavi Marmara, the vessel on which the violence and bloodshed broke out a few hours later. According to the Intelligence and Terrorism Information Center, Hamas regards Turkey as a target audience for its propaganda work. The IHH actively supports Hamas, the terrorist organization responsible for 40% of suicide bombings attack against Israelis and the firing of thousands of rockets against Israeli civilians living in communities along the Gaza border including the cities, Sderot and Ashkelon.In January 2009, IHH head, Bulent Yildirim met with Khaled Mashaal, chairman of Hamas' political bureau in Damascus, where the Hamas leader thanked Yildirim for his support. The IHH, which also has links to Al-Qaeda and global jihad operatives, has organized public support conferences for Hamas in Turkey, since Hamas took over the Gaza Strip in 2006 and has even opened a branch in Gaza. Three of the four Turks killed in the Israeli attack on the "Freedom Flotilla" bound for the Gaza Strip wanted to die as Martyrs, said their relatives and friends. The wife of one of them, Ali Haydar Bengi, told the Vatan daily: "He used to help the poor and the oppressed. For years, he wanted to go to Palestine. And he constantly prayed to Allah to grant him Shahada (Martyrdom). The third victim was Ibrahim Bilgen, a 61-year old pensioner and father of six sons. He was a supporter of the Felicity Party, an Islamic movement in the south-eastern city of Siirt, Anatolia news agency reported. His brother-in-law, Nuri Mergen, told the Agency: 'He was an exemplary man and a truly good man. That's why he was truly worthy of Shahada (Martyrdom). Allah granted him the death that he wished for.'" 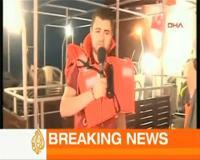 The Al-Jazeera reporter who first set off worldwide hysteria and rage over an alleged brutal IDF assault on the Gaza aid flotilla on Monday appears to be coming clean, telling Reuters late this week that some 20 Turkish men on board the Mavi Marmara flagship had planned a hostile reception which – with other evidence found on board – indicates they were out to maim and kidnap Israeli soldiers. Andre Abu Khalil, a Lebanese cameraman for Al-Jazeera TV, initially reported around dawn on Monday that “civilians… women children and the elderly,” had been ruthlessly attacked by IDF forces surrounding and assaulting the ship, leaving at least two dead. But he is now admitting that a group of Turkish men had prepared themselves for an effort to forcefully prevent the boarding Israeli commandos from reaching the wheelhouse and commandeering the ship. The Reuters report also claims that four injured soldiers were dragged below deck and temporarily held hostage during the 10-15 minute skirmish. Evidence found on board the vessel this week also suggests that firearms used against the Israeli soldiers but still unaccounted for were thrown overboard by ship passengers. Investigators found gun-sights and cartridge-magazines not fitting IDF weapons in a search of the ship, Israel Radio reported Friday morning. Coded messages apparently referring to scenarios of soldier-kidnapping and of soldier fatalities were also found on board, as well as recorded messages by some passengers saying they intended to become shahids (Muslim martyrs). Flotilla Passenger: "I Want to Be a Shahid (Martyr)"
As the results of interrogation of crew and passengers of the Mavi Marmara became available it is was clear that the Turkish government was a major player. "According to statements from the passengers, Turkish Prime Minister Tayyip Erdogan maintains close contacts with IHH. The flotilla set sail with the full knowledge and agreement of Erdogan, who expressed personal interest in its success and his intention to exploit it promote his status in Turkey and the Arab-Muslim world. Passengers said that before the flotilla set sail, Prime Minister Erdogan constructed a scenario based on a possible confrontation with Israel which he could use to further his own needs. The statements were supported by descriptions found in files on laptop computers belonging to the passengers." A statement from a journalist who was a passenger on the Mavi Marmara, who had good connections with the heads of the Turkish government and with Bülent Yildirim, head of IHH. According to reliable information, IHH had links to global jihad and Islamic terrorist networks in the past and assisted jihadist terrorist cells in many countries, including Bosnia, Syria, Iraq, Afghanistan and Chechnya. IHH provided mainly logistic support for transporting weapons and funding. And the Humanitarian Aid it was all supposed to be about? Hamas officials are refusing to allow into Gaza some 21 truckloads of humanitarian aid off-loaded from the three cargo ships in the ‘Freedom Flotilla’ forced to dock at Ashdod port on Monday. The trucks have been waiting since Wednesday to go into Gaza at the Kerem Shalom border crossing, pending approval from Hamas, but the Islamist terror militia is first demanding the release of all those detained from the flotilla as well as delivery of all the cargo on board the vessels. Most of those held have been deported already, while a few remain in hospital and several Israeli Arab figures are under house arrest. Meanwhile, the only aid being withheld, besides the cache of weapons found on board, is the tons of concrete and steel rods which Israel fears Hamas will use to build bunkers. The rest of the aid was of a type not really needed, since these items are sent in on a daily basis, Israeli officials said. This includes wheelchairs, stretchers, hospital beds, crutches, food, clothing and toys. "If the aid is so urgent, my question is, why are they not allowing it into Gaza?" said a senior IDF officer. The spokesman for the Coordinator of Government Activities in the Territories (COGAT) announces that the unloading of humanitarian aid from the flotilla continued during the day. Some of the medicine unloaded from the ships had expiration dates from 2009. Furthermore, in the ships was found military camouflage fabrics- that were supposed to be delivered to the Hammas terror regime. The Palestinians are delaying the transfer of the humanitarian aid that was unloaded at Kerem Shalom crossing. The United Nations will take to Gaza tons of aid supplies languishing in an Israeli port for two weeks since they were seized in a bloody sea confrontation, the Israeli military said Tuesday. Richard Miron, a spokesman for the U.N. Mideast envoy, confirmed the deal. The IDF said the aid, taken from a six-ship Gaza-bound flotilla after nine people died in clashes, would fill 70 trucks. Up to now, the Hamas rulers of Gaza have refused to accept the aid as a protest against Israel's three-year blockade of the territory. The Iranian Red Crescent announced on Monday that it will be sending two ships to Gaza this week. "to bring about the end of the siege on Gaza; two simultaneous convoys -one by land the other by sea - to set forth on SUNDAY SEPTEMBER 12th. The land convoy will leave from London and travel across Europe to Turkey Syria and ultimately through the Rafah Gate into Gaza. It is expected the convoy will pick up vehicles and volunteers in each country through which it passes. The target is to enter Gaza with 500 vehicles. The sea convoy will travel around the Mediterranean gathering ships, cargo, volunteers from each country. The target is to enter Gaza with sixty ships. The aim will be to arrive on Gaza's frontiers at the same time. And to enter with the world's largest ever aid convoys. And to thereby render the siege null and void." The world's largest ever media circus; more likely! We need to get the facts out to show how ridiculous is the whole premise on which this plan is based. 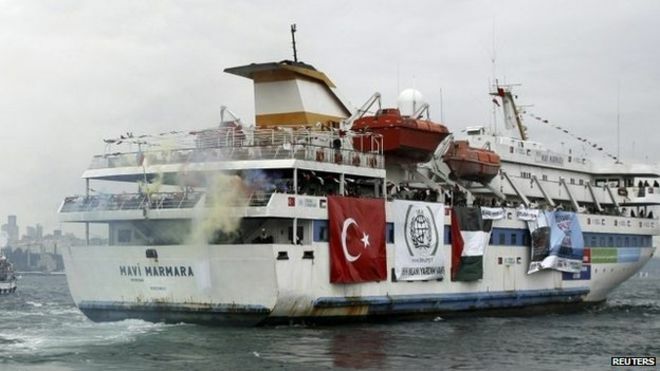 Ha'aretz reported early July 2011 that Turkish and Israeli diplomats have been shown a copy of the UN's final report on the Mavi Marmara flotilla incident from May 2010. The report contains harsh criticism of Turkey for failing to prevent the flotilla from sailing, as well as upholding Israel's legal right to impose a naval blockade on the Gaza Strip. The UN investigative committee, headed by Geoffrey Palmer, also criticized Turkey for its highly politicized investigation into the incident and praised Israel for its own investigation which it said was performed to levels consistent with international standards for fairness and integrity. In yet another unfriendly move by the Islamist regime which currently rules Turkey, a court in Istanbul began proceedings against four former IDF commanders, including former Chief of Staff Gabi Ashkenazi. The court is trying the IDF leaders in absentia on charges including "inciting murder through cruelty or torture" during the Mavi Marmara flotilla incident on May of 2010. Israeli officials have dismissed the proceedings as a "show trial" and "political theater" but is only the latest act by Turkey in retaliation for the incident, despite a UN report issued in September 2011 which called Israel's actions justified and legal under international law.